I will be on sabbatical for the 2012/2013 academic year. Avra Laarakker, Master's student, thesis: "Topological Properties of Tiles and Digit Sets", Acadia University, Fall 2007 - Summer 2009. Nicolas Coombs, NSERC Undergraduate Summer Research Award, Acadia University, Summer 2010. Natasha Mandryk, Summer Research Assistant, Acadia University, Summer 2007.
connections to multidimensional wavelets and frames, and analysis on fractals. DNA and molecular computing, quantum computing. Here is an overview of my research in slides. Avra S. Laarakker and Eva Curry, Digit sets for connected tiles via similar matrices I: Dilation matrices with rational eigenvalues, submitted. Eva Curry, Radix and Pseudodigit Representations in Zn, to appear, Proc. AMS. Eva Curry, Multidimensional Radix Representations and the Hot Spot Theorem. "Tapas in Experimental Mathematics: Papers from AMS Special Session on Experimental Mathematics; January 5, 2007 New Orleans, Louisiana", Contemporary Mathematics, 457. American Mathematical Society, Providence, RI, 2008. Eva Curry, Low-Pass Filters and Scaling Functions for Multivariable Wavelets. Canadian J. Math. 60 (2008), no. 2, 334-347. Eva Curry, Radix Representations, Self-Affine Tiles, and Multivariable Wavelets. Proc. AMS 134 (2006), no. 8, 2411-2418. 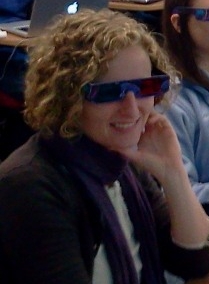 Introduction to Sage, Sage Days 45, ICERM, Providence, RI; February 2013. Probabilistic Approach to Radix Representations and Pseudodigits, International Conference on Advances on Fractals and Related Topics, Chinese University of Hong Kong, Hong Kong, HK; December 2012. Martin and Poisson Boundaries for Low-Pass Filters, Colloquium, Department of Mathematics, Chinese University of Hong Kong, Hong Kong, HK; November 2012. AMS Spring Eastern Section Meeting, Special Session on Analysis of Wavelets, Frames, and Fractals, George Washington University, Washington, DC; March 2012. 4th Cornell Conference on Analysis, Probability, and Mathematical Physics on Fractals, in conjunction with AMS Fall Eastern Section Meeting, Special Session on Analysis, Probability, and Mathematical Physics on Fractals, Cornell University, Ithaca, NY; September 2011. Jonfest, workshop on Computational and Analytic Mathematics in honour of Jonathan Borwein's 60th birthday, Simon Frasier University, Burnaby BC; May 2011. A One-Step Test for Connectedness of Radix IFS Tiles, AMS 2011 Spring Southeastern Section Meeting, Special Session on Fractals and Tilings, Georgia Southern University, Statesboro, GA; March 2011. Similar Matrices and Topological Properties of Self-Affine Tiles, Analysis and Number Theory Seminar, Department of Mathematics and Statistics, Dalhouse University, Halifax, NS; March 2010. There is a common perception, most famously expressed by the mathematician G.H.~Hardy, that applications of mathematics only "accentuate the existing inequalities in the distribution of wealth, or more directly promote the destruction of human life." [Hardy, "A Mathematician's Apology"] In other words, Hardy claimed that applied mathematics was antithetical to the pursuit of social justice, that is, working to change our political, economic, and social structures to achieve more even distributions of wealth and political power and to eliminate oppression. A glance at the non-academic employers in mathematical job listings reinforces this conclusion. That young mathematicians may find their non-academic job options either uninteresting or inconsistent with their personal ethics, as Hardy did, has serious consequences for the profession, and for the direction of applied mathematics research. Yet applied mathematics research is, indeed, done in areas that could be considered supportive of social justice goals. Different funding levels for different applications combined with the fact that many are in newer areas, such as climate modeling or voting theory, mean that many mathematicians and students are less aware of such research. A few examples were presented at a panel discussion that I organized at the January, 2011 Joint Mathematics Meetings in New Orleans, LA. However, much work is still needed to identify open research problems and opportunities for mathematicians to collaborate with non-mathematicians on applied research projects that have a social justice focus. Stay tuned for more information, including a web site dedicated to the Mathematics of Social Justice.